Home » Delhi » Delving Into Delirium! 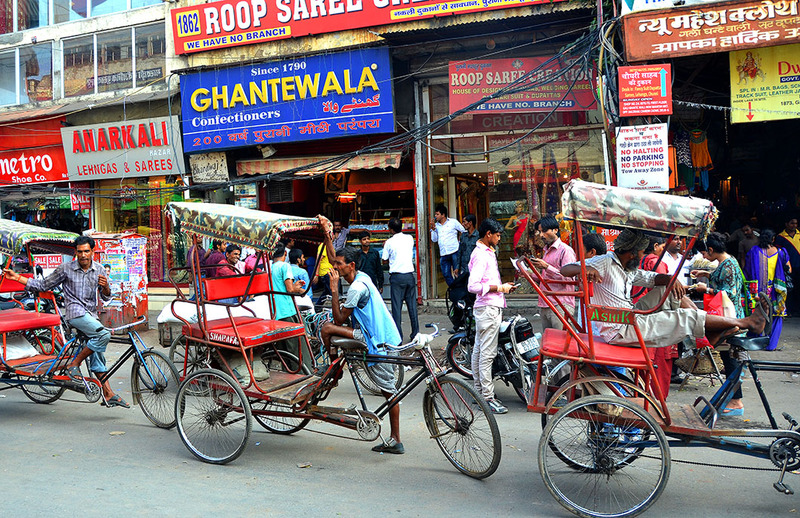 Getting to Chandni Chowk, for our tour with Delhi Heritage Walks was hard work that Monday afternoon. First a purported three minute walk to the subway station ended up being ten, I am guessing, because we neglected to specify the name of the station. Once there (Janpat), we found every ticket vending machine out of order, and lines in front of the counter extending almost all the way to Connaught place! Outside, a paan chewing auto driver, the kind you wouldn’t want to meet on a dark deserted street, grunted an insolent, “Do sau” (200). I could sense my scrupulously punctual husband beginning to panic, but I wasn’t about to get into that insolent man’s vehicle, even if I was inclined to pay that price. Further down, we found a decent soul who offered to take us for a lot less and nearly got beaten up for it! That sorted, we proceeded to get stuck in the worst of Delhi traffic. Chavi Sharma, our walk leader, had messaged us twice already, urging us to return to the metro station, since the pile up seemed crazier than usual. But we were too far ahead to turn back. We finally arrived nearly an hour late to the pulsing, humid throng of humanity, in a place that would require every ounce of an insanely vivid imagination to be referred to as ‘Moonlit Square’! Gantewala (Bell ringer) confectioners is said to have got its name when emperor Shah Alam’s elephant, demanded its daily sweet fix, by stopping in front of his shop and shaking the bells around his neck! The chaos of Chawri Bazaar. Where courtesan’s anklets jingled once! Chandni Chowk, said to have been designed by princess Jahan Ara, eldest daughter of Shah Jahan and Mumtaz Mahal, was once a glittering tree lined artery (check out some illustrations and old photos here!) connecting the palace inside the Red Fort to the Fatehpuri Mosque at the opposite end. With opulent mansions and luxury merchandise arrayed on either side, and a canal running along the middle….the stuff of legends. Delhi’s nobility lived here then. Even up until independence. Its erudite elite. Poets and scholars, and founders of universities. Partition brought about their exodus. Mostly to Pakistan, some to the the rest of the country. A few stayed back. And like water seeking its level, the underprivileged filled up the vacuum. 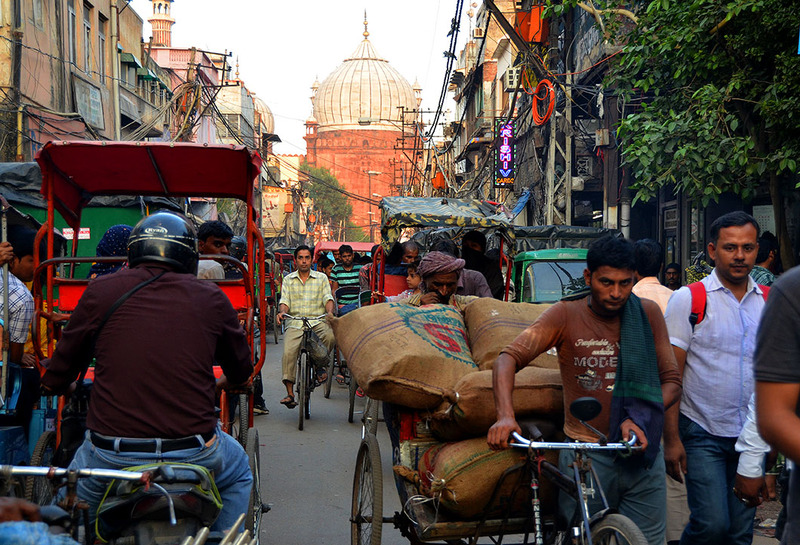 Today, it is still the main drag in the warren of streets comprising Old Delhi. Or Delhi 6 as it is commonly referred to (for its pin code). But reduced to a dirty crowded ghetto. A mere shadow of its old self, with its ruined city walls and gates, and scores of grimy shopfronts standing cheek by jowl with legendary (and Delhi Belly inducing, for those that do not posses our cast iron guts!) food stalls. Nearly a million people crammed into the roughly six square kilometer walled space under tangled canopies of electric cables. The forlorn fort almost as dilapidated as its surroundings. 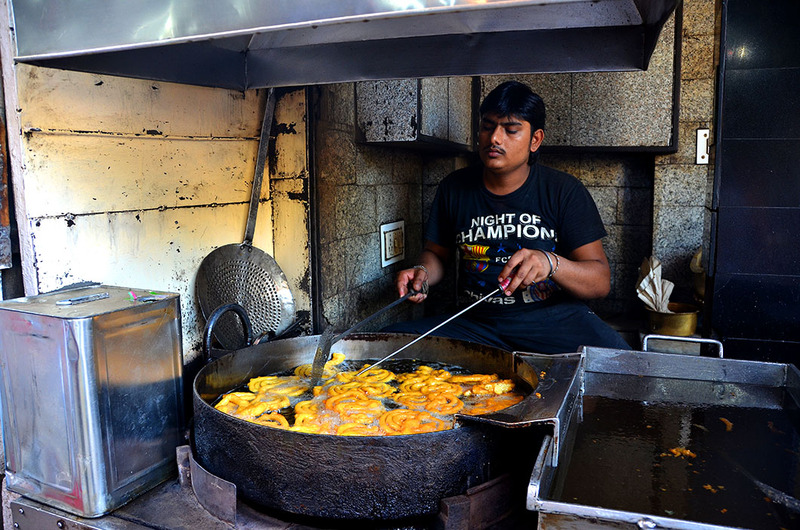 Old Famous Jalebiwala – Have eaten better elsewhere. Make no mistake. There is beauty to be found here if you can brave the seething mass of people, the incessant honking of two wheelers, and the speeding cycle rickshaws. And with a knowledgeable guide in tow. Old havelis (mansions) and hidden temples. Centuries old businesses still being run by the same families. And of course, the magnificent Jama Masjid. There is history, however faded and stained, etched into every wall, every street corner, every face. And photo ops at every turn. This was after all Shahjahanabad: the last capital of a glorious empire. But don’t expect romance here. The kind one associates with old towns across the world. This isn’t a show put on for visitors. This is the brutal grind of life. Of sheer survival. Beautiful in its intensity. Not pretty. PS: Delhi Heritage Walks organise scheduled walks every weekend. Check their website for details. Or email them for private customised walks. Well it doesn’t look to have changed much! But unlike you, I only got to see the mass of life in the streets, no posh houses or temples for me when I visited there. Food looks good though, I reckon I could still manage it, we ate pretty cheaply when I visited India. I wasn’t vegetarian back then, but we didn’t eat meat anyway – never looked worth the price. 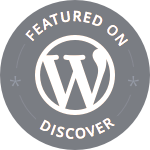 Great post Madhu, I love your India posts. Thank you Sally. Glad you enjoyed it. Lovely post which really captures the hectic atmosphere of the area. I had to smile when I saw your second photo – I have a similar one http://www.flickr.com/photos/14870023@N02/5550135710/in/set-72157626325296742 – not as good as yours but taken from an identical position! How uncanny Suzanne! That is almost from the same spot 🙂 I see you stayed in the Imperial as well. Which did you prefer the Taj or the Imperial? We just went for tea at the Taj so can’t say. The Imperial was lovely but had to factor in extra time to get our room due to all the museum pieces displayed! India is a that causes a division with me … Images increases my desire to visit … yet there is much that also works against that desire. Nonetheless, thanks for a vivid tour. I know Frank. India is and always has been a place of intense contrasts. Hard even for us to comprehend sometimes. Thank you for reading. “Intense contrasts” seems like the perfect description. …. BTW … Hope you can attend my holiday party on Saturday! …. doors will be open for your morning! Fashionably late is acceptable! Enjoy your trip. Incredible India! 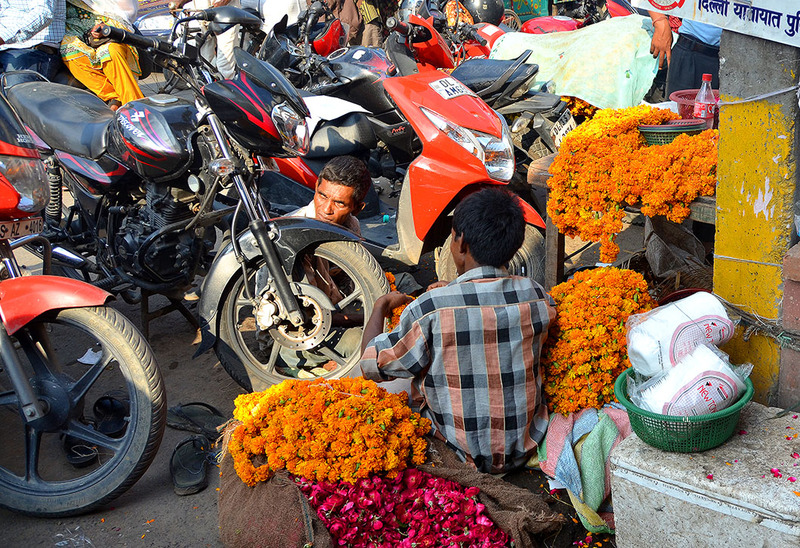 It takes a bit of getting used to the tangle of people in India, but it has so much to offer once you do. Tangle of people is the right word Debra 🙂 Glad you found your visit worthwhile. Jokes apart, it happens. I have been to the crowded inner city areas in Chennai, but only because I needed to buy paper and stuff that wasn’t available elsewhere and that I didn’t want to delegate to someone else. This trip to Delhi has inspired me to explore parts of Chennai that I never normally venture into. Lovely post and thanks for the tour. Everywhere India is being eroded by too many people. The drawings and old photos were wonderful. I expect there is little left of the grand houses vacated at partition though it may be under all the clutter of humanity. Can it only get worse? Madhu it sounds like even you were slightly culture shocked, so imagine how the ill prepared westerner might feel 🙂 I love it and your vibrant writing takes me back.dI’d like to return and immerse myself in its drama and beauty. Quite an eye opener. But count me out – my temperament would not allow me to wade through something as jam-packed and unruly as this place. Partly because it is greatly upsetting to witness such (former) grandeur reduced to such a state. Quite sad. Thanks for taking all of us along with you, via your vibrant photos Madhu. I kept wondering what the air smelled like, the hot oil’s scent. Felt the crush of traffic with your descriptions, too. A real adventure. What an incredible tangle of everything Madhu! Will get there one day, your fabulous pictures and explanations are so inspiring! I lived in Bombay (now Mumbai) so it all looks normal to me. such a great, colorful travel diary! As much as I would love to see Delhi, it sounds like it would be mentally and emotionally exhausting. I usually have to psych myself up for haggling/arguing/being at the mercy of others. I’ll remember this for the day when I finally explore India. Your description of this intensity makes me remember the one and only time I’ve been to India, New Delhi. It was a shock really, with all those people. I have never been to a country/city with such masses of people close upon. It really takes som etime to adjust. You ended it so well. I was getting afraid that Ima have to disagree with you and felt like you were being snotty. I love the very last sentences. You said it well. The same feel I had in Naples or cities in the Philippines, but I think this place is even more chaotic. I would love to be there. 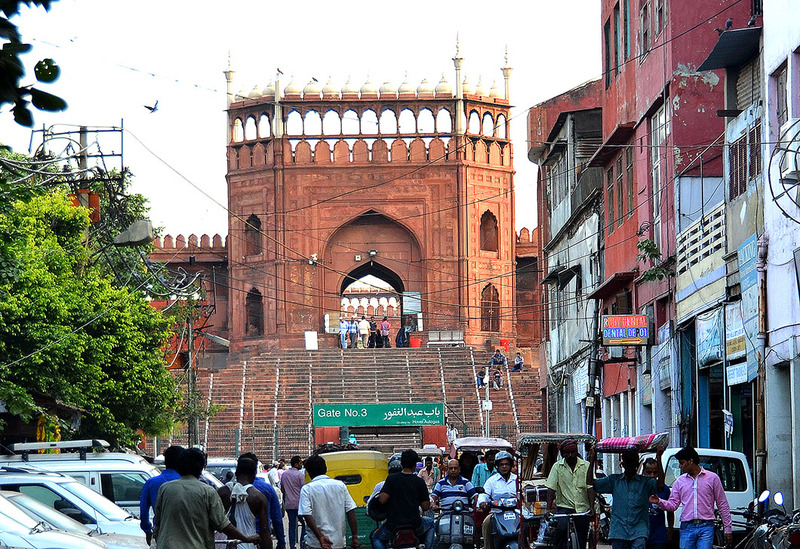 Its over crowded, its intense, its dirty and its definitely not a place for the faint hearted…but it is still the most famous chowk where almost every Delhi-ite would have gone ‘shadi’ shopping, and a place most overseas tourists would have on their to-do list. Having been there a few times – and loved it each time despite the chaos, i would advise visits on a sunday when the market is closed and its much more peaceful if you just want to see the old city. I only wish we could preserve our glorious past better. You really paint a vivid picture, Madhu. Hard to believe that this scene is played out daily. Masses of people all trying to eke out a living. Beauty in its intensity. I’m looking forward to our spring trip. Your words, I’m sure, will ring true as I get caught up in the chaos. But, I do want to experience it.